In 1853 and 1854, the Rochester Ladies' Anti-Slavery Society, or RLASS, had the perfect gift idea: Autographs for Freedom. A coffee table book in the days before coffee tables. First and foremost, it raised money. The RLASS was a small organization with a large mission. They helped support the North Star, the newspaper that Frederick Douglass published in Rochester. Smaller amounts of money went to individual people escaping slavery who passed through Rochester on the way to Canada. They rented space and hosted prominent speakers. Second, according to an RLASS report, the book was "dedicated to the cause of liberty." The approximately 45 entries included an attack on the Fugitive Slave Act and similar causes. Granted, most, if not all, of the readers already were supporters but the book compiled many creative and polemic writings on the topic of the day. It raised the profile of the group with movers and shakers of the day. The novel Uncle Tom's Cabin was top-of-mind in both the US and England; thus, as noted in the introduction: "we desire to express our warm gratitude to each of the distinguished philanthropists who contributed to its pages. In this connection we would especially mention Mrs. H.B. Stowe, whose deep interest in our enterprize [sic], whose wise suggestions, and whose generous assistance were invaluable to us." The women published two volumes in the U.S. before moving on to other endeavors. 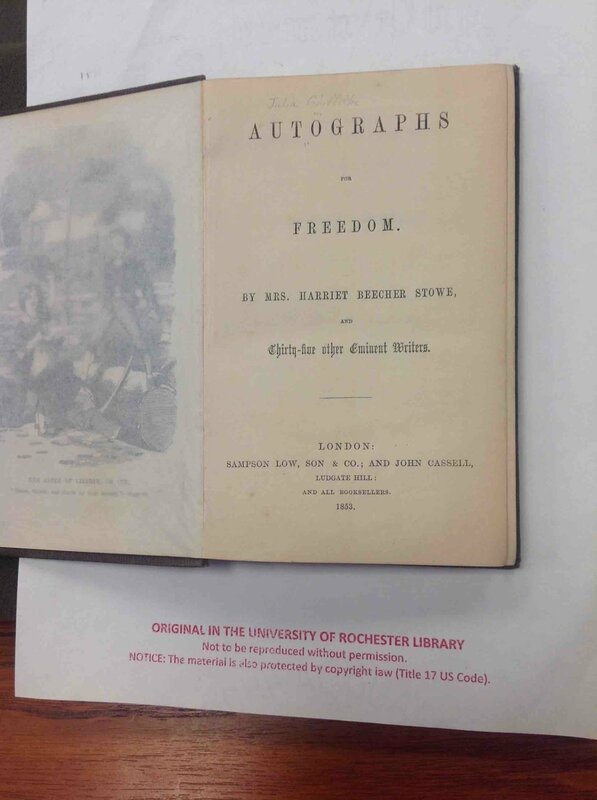 I viewed an original Autographs for Freedom in the collection at the University of Rochester. You can read the text online on archive.org. 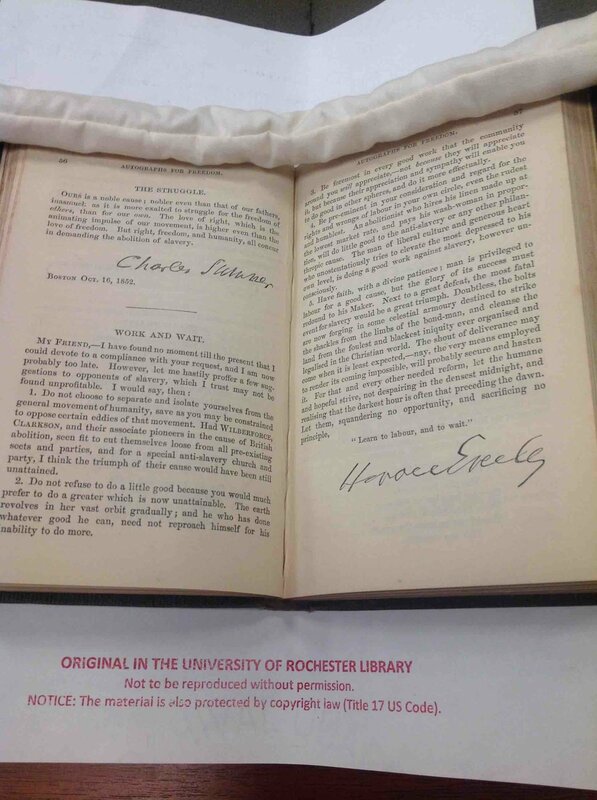 I can't rival Charles Sumner and Horace Greeley, much less Harriet Beecher Stowe, but many readers enjoy signed books. Contact me if you would like me to sign a copy of A Civil Life in an Uncivil Time.